Coastal adjacency brings out your spontaneous side, but Santa Monica has had trouble keeping up—until...now. Opening tonight just off Ocean Avenue, Robata Bar won't require forethought, a wardrobe change or neighborhood relocation for a classy-but-casual spot to keep a good date going. You two lovebirds will recognize the vibe instantly—it's the latest addition to the Sushi Roku-BOA-Katana empire. Just grab a table at the front, a seat at the bar or a booth down the side (the small space seats just 50) and order away. If you need an ice-breaker, the tassel-covered ceiling is a good start. The robata-yaki portion of the small-plates menu is not only the most prominent—it translates to rib-eye, shrimp or King Crab Legs on a stick—but also the most familiar (cough, Katana). 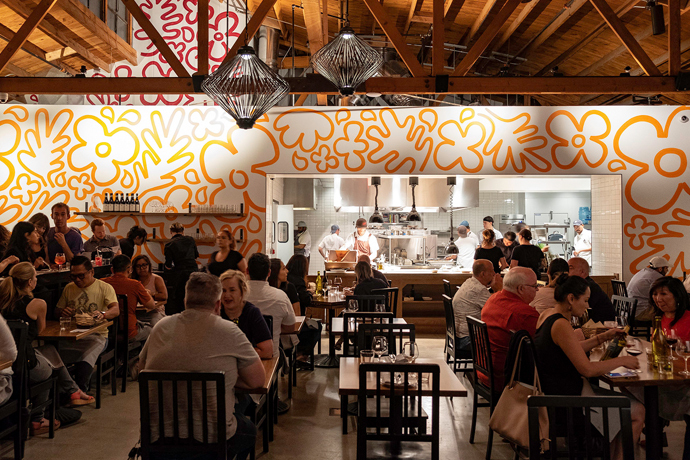 You won't find the shooters, ceviche and tartar elsewhere, though, so we recommend you try the Oyster with Quail Egg and Uni or the Whitefish "Traditionale" with Shichimi Popcorn. And don't plan on selecting a sake from the bottles behind the bar—those are for decoration only. The sake sampler is a good start for variety, but the Poochi-Poochi (a sparkling sake) and the Nigori Ozeki (it's unfiltered, sweet and milky-looking) are the most unusual selections. The right place, after all, is only the beginning.